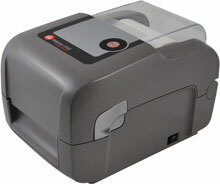 The Datamax-O'Neil E-Class Mark III is a family of compact desktop thermal printers that are designed for a wide variety of industries and applications that require a reliable and cost effective barcode printer. Datamax-O’Neil applied its industrial printer expertise to provide customers with an entry level printer that has the features and reliability normally found in more expensive printers. The Datamax-O'Neil E-Class Mark III is affordable to own, easy to use and economical to operate. Datamax-O'Neil has made the E-Class Mark III easy to use with quick loading media and an interactive LCD screen. Users will also notice a substantial reduction in their daily operational costs thanks to the Datamax-O'Neil E-Class Mark III’s larger media and ribbon roll capacity. The Datamax-O'Neil E-Class Mark III is one of the best values on the market. It is competitively priced with a proven design and reliable performance that will continue to operate long after other printers have failed. Why pay for features you don’t need? The E-Class is available in four distinct models that offer the features necessary to meet the broadest range of customer requirements. The E-Class Mark III has many outstanding features that provide a variety of benefits. Below is a brief list of the many features and associated benefits the E-Class Mark III printer offers. Safe from spills –The sealed user interface panel is sealed to prevent liquids and debris from damaging the sensitive user controls. Lowered Ribbon Costs – Larger one-inch core standardized ribbons cost less than the typical smaller desktop ribbons. Easy Serviceability – No tools or experience required to replace the most critical parts, the printhead and platen roller. Large Graphical Display – Allows for quick and easy changes and provides visual status indication (Professional models only). Optional Wireless – 802.11 a/b/g and Bluetooth communication makes it easy to share, manage, and place printers where you need them (Professional models only). Affordable to Own - The E-Class Mark III was carefully designed to maximize your investment value by offering a competitive purchase price, double walled construction for increased durability and a proven design for long term reliability. Easy to Use - The E-Class Mark III makes it easy to replace existing printers or install new ones with popular language emulations included with each printer and a selection of connectivity options. Users will appreciate the easy-to-use LCD screen and quick loading media/ribbon. Economical to Operate - The E-Class Mark III reduces daily operational costs by minimizing power consumption, and reducing the costs associated with printer consumables such as labels and ribbons.